On 22nd-23rd May 2014, National Award Authority (NAA) organized an Award Leader Training Workshop (YES Workshop) at Award Training Centre, New Delhi. Nine Award leaders from six different institutions participated in the workshop. Ice breaking session was the curtain raiser for the workshop; it was led by our National Director Kapil Bhalla who also gave an introduction on the Award. The next session was led by Bivujit Mukhoty (Programme Manager) who shared details related to the Award philosophy and Award framework. One of our newest member of National Training Panel (NTP) Gyanendra Tewatia delivered session on one of the four pillars of the programme i.e. Service. Mr. Tewatia started the session with an activity which helped participants to get the feel the importance of this section. Post lunch session was assigned to Skills and Adventurous Journey sections which were led by Bivujit Mukhoty. Kapil Bhalla also gave a session on volunteering which is considered an integral part of the programme. The day ended with the presentation of IAYP India movie, "Why Not You?”. Second day started with the last pillar of the Award i.e. Physical Recreation. The session began with some on-the-spot physical activities and then moved onto the requirements and importance of Physical Recreation. This was followed by covering Residential Project which is part of only Gold Award programme. Some details regarding the technical aspect of the Award such as risk management were also discussed, which concluded the pre-lunch session. Post-lunch session started with Pallavi Gill (Gold Award Holder) talking about the benefits of Award. Pallavi also shared her Award Journey experience and the benefits of the Award. Penultimate session was on the Web Resources and Online Record Book (ORB) which was led by Priyank Kumar Gupta (Head YES Communication Project & NTP Member). Mr. Gupta’s session was about details regarding International Award for Young People website and the presence of Indian Award at different social media platform. Priyank Gupta also talked about one of our new innovations related to the programme, that being Online Record Book (ORB). He shared details on ORB process and the rollout plan for ORB. The final session of the workshop was the review session, where the gist of the workshop was covered and doubts of the participants were cleared. The workshop was concluded with an appreciation note from Kapil Bhalla followed by certificate presentation to our new Award leaders. ordinary to an extraordinary person. I am also in no doubt that it helped me to get my first job with the Malaysian Government – the Award has had a major impact in my life. was interviewed for my current job. My employer was curious to know what the Award was all about. When I explained all the details to him, he was impressed with my involvement – especially the Service section, my contribution to society. I had been volunteering in some community projects in rural areas, and am chair of a young volunteer organisation. “Award holders are more confident in venturing into any uncharted territory where new environment, challenges or people are abundant and the norm. At least they are willing to endeavor with an excellent attitude of positive vibes... If anyone wants an energetic young recruit armed with a vibrant attitude to any working environment, this is the right platform from which to recruit future leaders.” Mohamed Rahiman, CEO of Quantum Training Centre, Kulaijaya, Malaysia, and Ravi’s employer. The Award has enabled me to realize my inner potential and start my career. I want to be a successful businessman, and also be a great politician in years to come. My motivation to do the Award was not about employment but to be a better person for my family, society and country. But it's a big bonus when it helps me to get a great job. 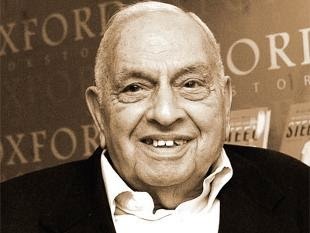 Russi Mody, former chairman and managing director of Tata Steel passed away on May 16, 2014. We at International Award for Young People India would like to send our condolences to the Mody family and Tata group for their loss. Not many know The Man of Steel, as he was fondly known held an integral role in developing the Award programme in India. He was among the first renowned individuals in India who had helped the Award programme to sprout in the country and helped in spreading the importance of participating in the Award programme among the youth of our country. We at IAYP India will always be indebted towards Russi Mody for his support in helping the Award programme grow in India. Achieving your Gold Award is really a big step in your young life. It shows that you have the ability, focus and determination achieve. It shows you have done your share to achieve all-round development and at the same time open to learn from what your future has in-store for you. So it’s only right that you get a proper celebration for your achievement. Our Gold Award Ceremony are designed to celebrate this achievement. 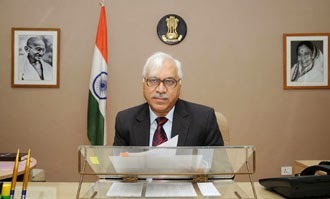 We are happy to announce that S. Y. Quraishi, former Chief Election Commissioner (CEC) of India, has consented to presenting the Gold Awards to the successful participants at the Annual Gold Award Ceremony on July 7, 2014 at India International Centre, New Delhi. 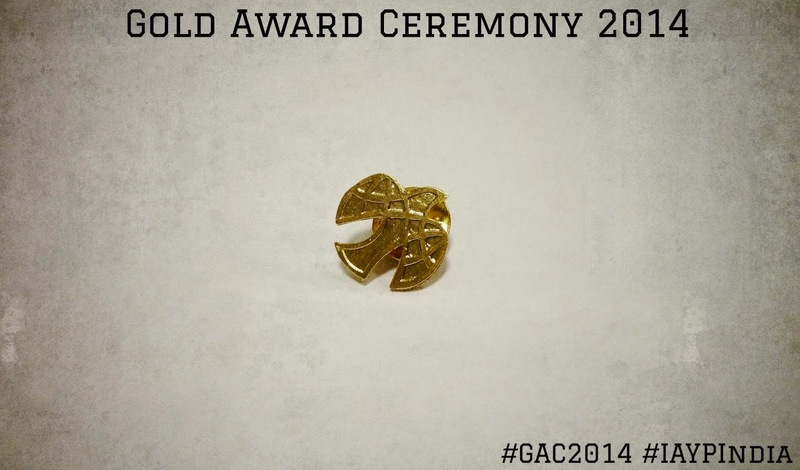 You can soon expect to receive an invite to GAC 2014 and your presence will make this event worthwhile. Ever seen anyone transform from being disconnected with a sport to being a passionate follower of the same game? Here is the story of Udeept Bhatnagar (Gold Award participant) from Delhi Public School Gurgaon, who fell in love with a beautiful game. The 2006 Football World Cup is the reason for my enthusiasm for the sport, the quarter final between England and Portugal in particular. Mesmerized by Cristiano Ronaldo’s moves and conflicted because of the controversial sending off of Wayne Rooney helped me discover my love of football, even though only eight years old at the time I knew that I had found something I loved. The excitement of watching the players on the pitch hold possession of the ball and threaten to score at any minute found a way into my heart. The International Award for Young People (IAYP) programme gave me the motivation to actually start playing football. I was enthusiastic about the sport but never really played the game, leisure playing with my friends was all the experience that I possessed and the IAYP helped me hone my football skills. Once I started playing I started watching matches more critically, I tried to copy them; how they controlled the ball, how they ran with it and how they seemed to know what their team mates would do next. My passion for the game grew stronger after that, and no matter what it is the one thing that I have always found time for. I have represented my school in football on three occasions and I would rate myself as a decent player if not a good one which is a long way from being unknown to the details of the game. All of my waking moments beyond studying are dedicated to the beautiful game, be it on the field, be it on the watching a match or be it on the computer playing FIFA games. The International Award for Young People actually helped me realize my potential as a football player, also showed me why football is such a beautiful game.